Many ceilometers are influenced by water vapor absorption in the spectral range around 910 nm. Thus, a correction is required to retrieve aerosol optical properties. Validation of this correction scheme was performed in the framework of CeiLinEx2015 for several ceilometers with good agreement for Vaisala's CL51 ceilometer. For future applications we recommend monitoring the emitted wavelength and providing dark measurements on a regular basis to be able to correct for signal artifacts. 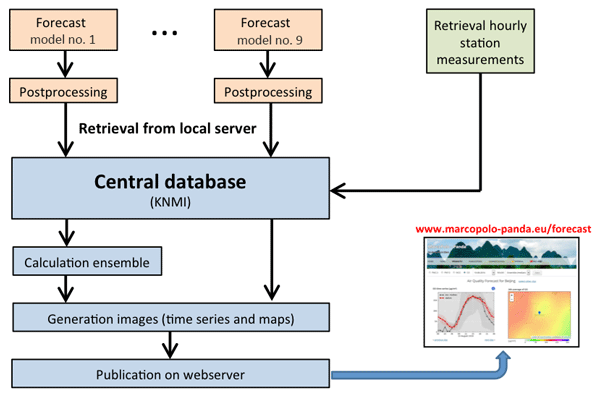 The paper presents the comparison of ECMWF-IFS model simulation of aerosol backscatter profiles to long-term measurements of an extended ceilometer network. A significant influence of the numerical description of the hygroscopic growth of sea salt aerosols on the agreement between model and observations was found. 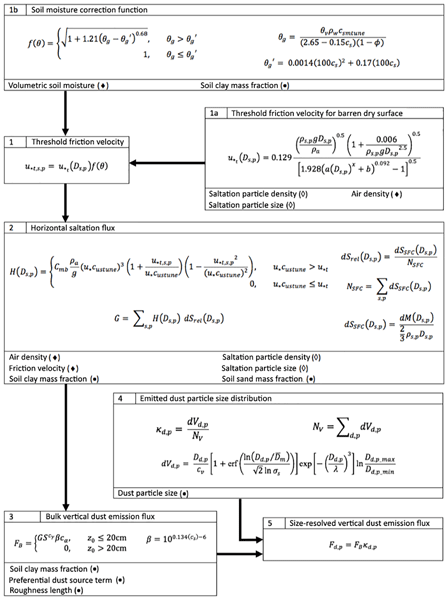 Consideration of the nonsphericity of dust particles in the model reduced the attenuated backscatter of dust by ~&thinp;30 % and improved the agreement between model and observations. libradtran is a widely used software package for radiative transfer calculations. It allows one to compute (polarized) radiances, irradiance, and actinic fluxes in the solar and thermal spectral regions. This paper gives an overview of libradtran version 2.0 with focus on new features (e.g. polarization, Raman scattering, absorption parameterization, cloud and aerosol optical properties). libRadtran is freely available at http://www.libradtran.org. For the past few years a large number of autonomous continuously operating single-wavelength backscatter lidars, so called ceilometers, have been installed. Currently the assessment of their potential for aerosol remote sensing is a major research topic. This paper focusses on the need to consider water vapor absorption if ceilometers emitting at wavelengths in the 905 to 910 nm range are used and proposes a correction scheme to improve the retrieval of the aerosol backscatter coefficient. Desert dust particles in general are not spherical, which changes their scattering functions against that for spheres that often are used for remote-sensing and radiation budget investigations. 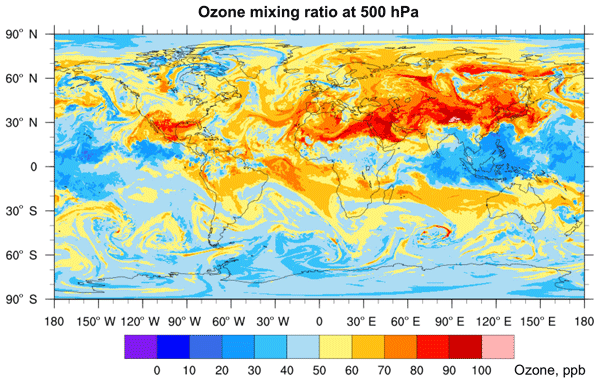 In the new version of the data base OPAC (Optical Properties of Aerosols and Clouds), which easily allows one to model a large range of microphysical and optical aerosol properties for individually decided component mixtures, now typical non-spherical mineral particles are taken into account. This paper provides an overview of the measurements done at an urban background site in Berlin from June-August of 2014. 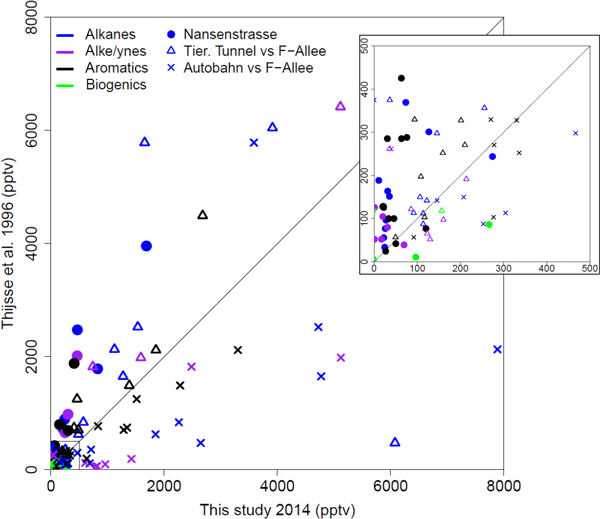 Results show that natural source contributions to ozone and particulate matter (PM) air pollutants are substantial. Large contributions of secondary aerosols formed in the atmosphere to PM10 concentrations were quantified. An analysis of the sources also identified contributions to PM from plant-based sources, vehicles, and a small contribution from wood burning. Mixing layer height as an indicator for urban air quality? Based on measurements with a ceilometer and from an air quality network, the relationship between the mixing layer height (MLH) and near surface concentrations of pollutants was investigated for summer 2014 in Berlin. It was found that the heterogeneity of the concentrations exceeds the differences due to different MLH retrievals. In particular for PM10 it seems to be unrealistic to find correlations between MLH and concentrations representative for an entire metropolitan area in flat terrain. Halo displays are produced by scattering of sunlight by smooth, hexagonal ice crystals. Consequently, the presence of a halo should contain information on particle shape. 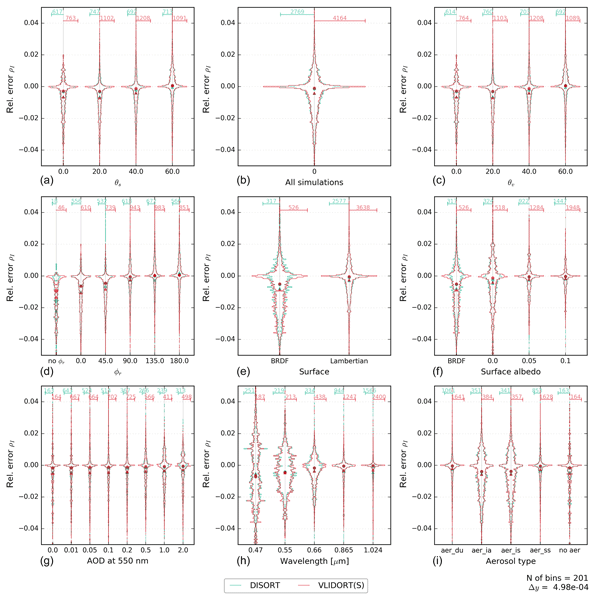 This study presents HaloCam, a novel sun-tracking camera system, and an automated detection algorithm to collect and evaluate long-term halo observations. Two-year HaloCam observations revealed that about 25 % of the detected cirrus clouds occurred together with a 22° halo indicating the presence of smooth, hexagonal crystals. Soils have been overlooked as a source of reactive nitrogen (N) emissions that are pronounced in the summer ozone season (growing season) and increasingly important as fertilizer use grows, while fossil fuel combustion sources of N decline. Mechanistic process models of soil N emissions are used in Earth science and soil biogeochemical modeling on a site scale. This work mechanistically models soil N emissions for the first time on a regional scale to better understand their air quality impacts. 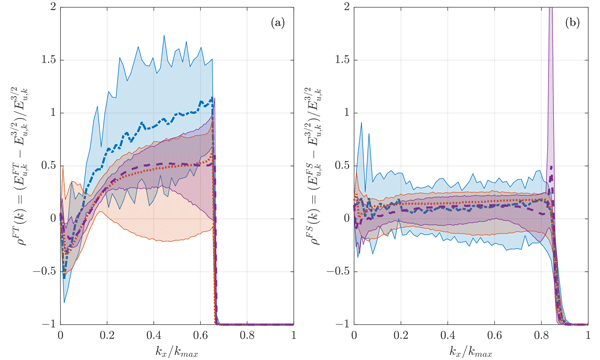 We present a methodological framework for the analysis of climate model uncertainty based on the functional data analysis approach, an emerging statistical field. The novel method investigates the multi-model spread, taking into account the behavior of entire simulated climatic time series, encompassing both past and future periods. 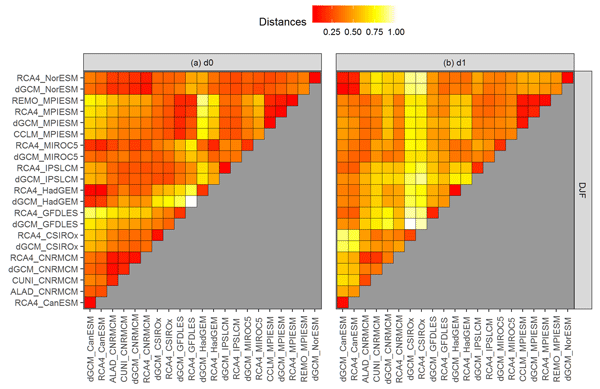 We also introduce an innovative way of visualizing climate model similarities based on a network spatialization algorithm that enables an unambiguous interpretation. We devised a system that simulates large ensembles of forecasts for European temperatures and the North Atlantic Oscillation index. 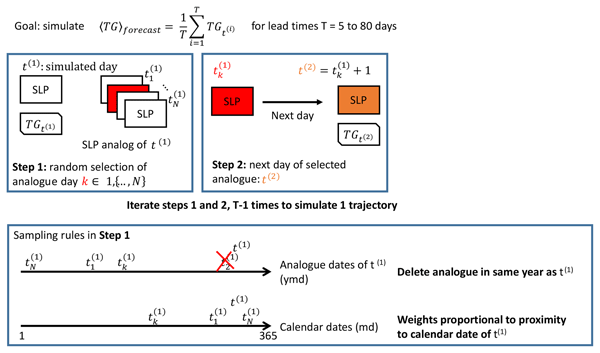 This system is based on a stochastic weather generator that samples analogs of SLP. This paper provides statistical tests of temperature and NAO forecasts for timescales of days to months. We argue that the forecast skill of the system is significantly positive and could be used as a baseline for numerical weather forecast. This work describes DATeS, a highly extensible data assimilation package. DATeS seeks to provide a unified testing suite for data assimilation applications that allows researchers to easily compare different methodologies in different settings with minimal coding effort. The core of DATeS is written in Python. The main functionalities, such as model propagation and assimilation, can however be written in low-level languages such as C or Fortran to attain high levels of computational efficiency. 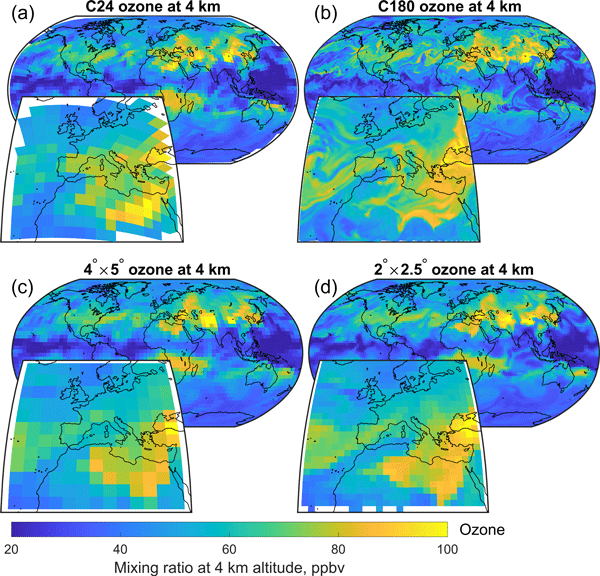 The implementation of the aerosol microphysics submodel MADE3 into the global atmospheric chemistry model EMAC is described and evaluated against an extensive pool of observational data, focusing on aerosol mass and number concentrations, size distributions, composition, and optical properties. EMAC (MADE3) is able to reproduce main aerosol properties reasonably well, in line with the performance of other global aerosol models. 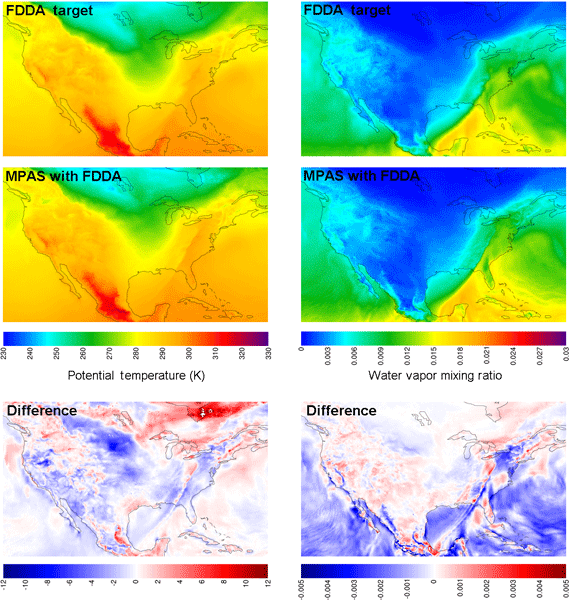 In this research article, we describe the development of a new model for the water cycle (evaporation, precipitation and transport) for a simple climate model called GREB. Before this work, the water cycle in GREB was merely a dummy. We compare our simple model against more complex models and find a similar skill. 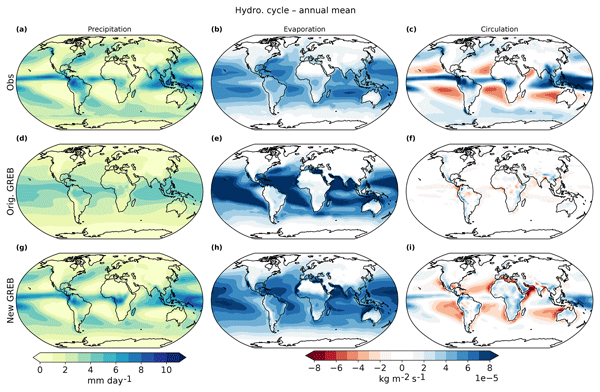 The results illustrate that the new GREB model's water cycle is a useful tool to study the changes of the water cycle to external forcings like El Niño or climate change. This paper reviews the history, code, and performance of the three dust emission schemes embedded in the WRF-Chem model, including the GOCART, AFWA, and UoC dust emission schemes, and provides the first full documentation of the AFWA scheme. A simulation case study is provided to explore differences in model output. 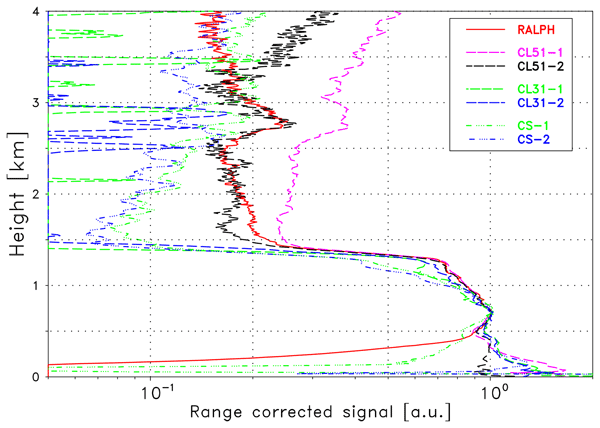 Results highlight the relative strengths of each scheme, indicate reasons for disagreement, and demonstrate the need for improved terrain characterization in dust emission models. An operational multi-model forecasting system for air quality provides daily forecasts of ozone, nitrogen oxides, and particulate matter for 37 urban areas in China. 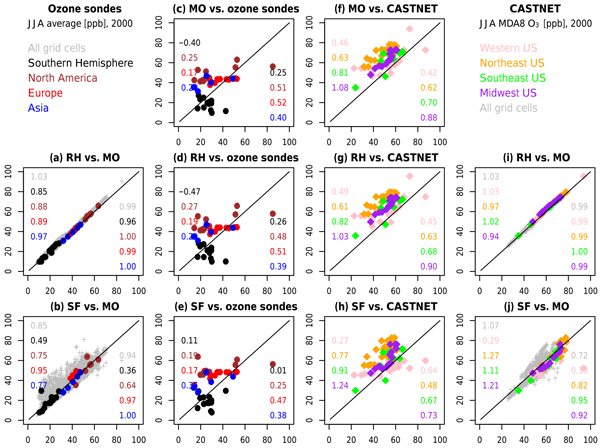 The paper presents an intercomparison of the different forecasts performed during a specific period of time and highlights recurrent differences between the model output. Pathways to improve the forecasts by the multi-model system are suggested. Tropopause polar vortices (TPVs) are coherent (anti)cyclonic features based on the tropopause common in polar regions with typical radii of 100 to 1000 km, intensities of 1 to 50 K, and lifetimes of days to months. Towards furthering our understanding of TPV structure and dynamics and their linkages throughout the earth system, the tracker more robustly represents TPV shape as variable size and intensity undulations on the tropopause and lifetime as material eddies with similarity over time. OLYMPUS is a model of air pollutant and greenhouse gas emissions for cities. 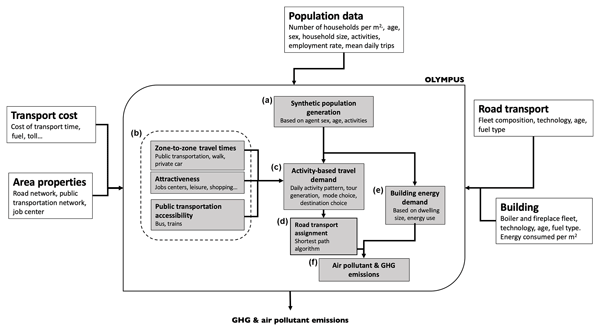 This modeling platform was designed to quantify the impact of urban policies on anthropogenic air pollutants by integrating household behavior into mobility and energy consumption in the residential and commercial sectors. Atmospheric aerosols play a key role in the climate system, but their exact impact on the energy balance remains uncertain. 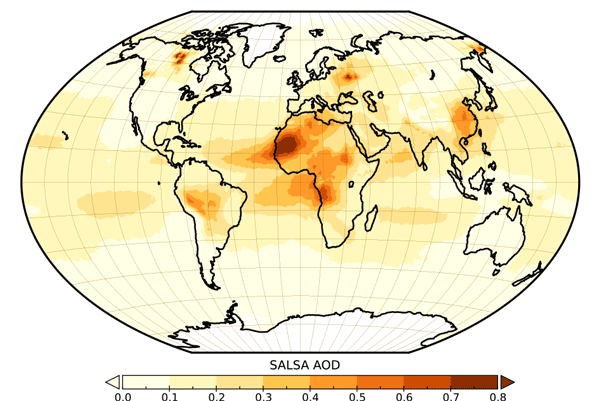 Accurate representation of the geographical distribution and properties of aerosols in global models is key to reduce this uncertainty. Here we use a new emission inventory and a range of observations to carefully validate a state-of-the-art model and present an updated estimate of the net direct effect of anthropogenic aerosols since the preindustrial era. 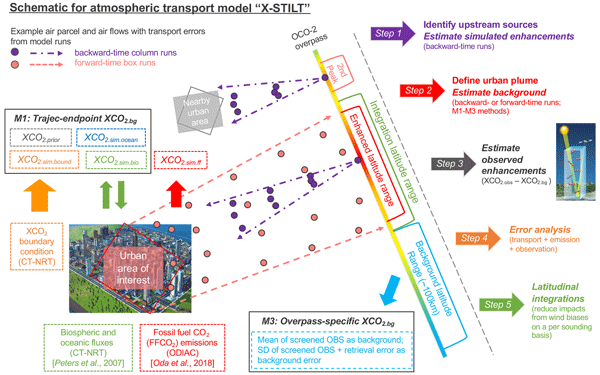 Urban CO2 enhancement signals can be derived using satellite column CO2 concentrations and atmospheric transport models. However, uncertainties due to model configurations, atmospheric transport, and defined background values can potentially impact the derived urban signals. 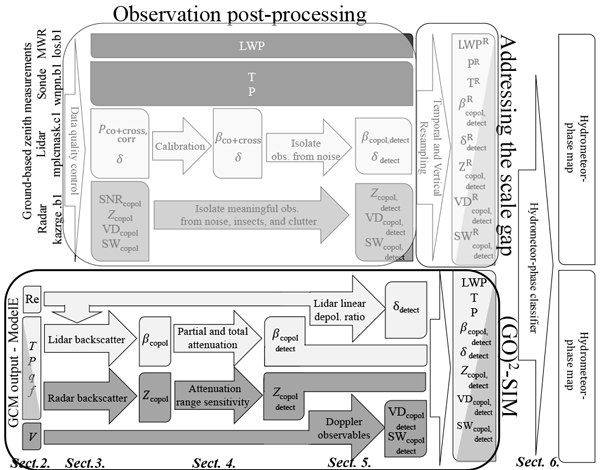 In this paper, we present a modified Lagrangian model framework that extracts urban CO2 signals from satellite observations and determines potential error impacts. We present a full-year online global simulation of tropospheric chemistry at 12.5 km resolution. To the best of our knowledge, such a resolution in a state-of-the-science global simulation of tropospheric chemistry is unprecedented. This simulation will serve as the Nature Run for observing system simulation experiments to support the future geostationary satellite constellation for tropospheric chemistry, and can also be used for various air quality applications. 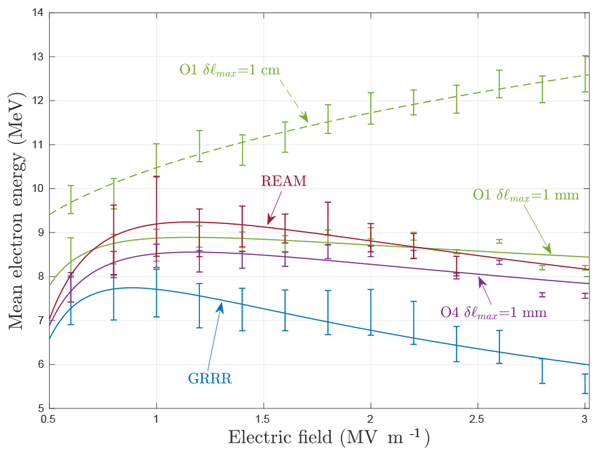 We evaluate three models (Geant4, REAM, GRRR) used in the field of high-energy atmospheric physics that are able to simulate relativistic runaway electron avalanches. Several models have been used by the community, but there was, up until now, no study evaluating their consistency in this context. We conclude that there are no major differences to report, and we discuss minor ones. We also provide advice on how to properly set up the general purpose code (Geant4) in this context. In this research we developed a time dependent dust source map for NMME-DREAM v1.0 model based on MODIS Normalized Digital Vegetation Index (NDVI). Areas with NDVI < 0.1 are classified as active dust sources. 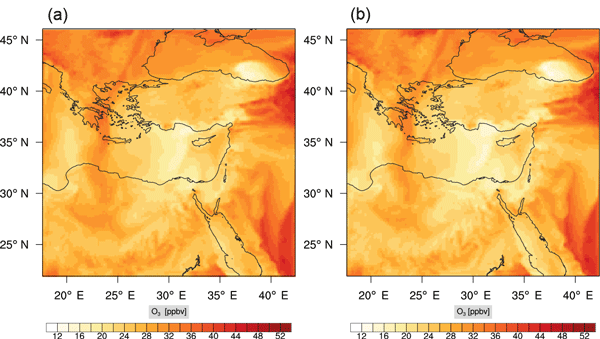 The new modeling system is tested for the analysis of dust particles dispersion over SW Asia using a mesoscale model grid increment of 0.1° × 0.1° km for a period of 1 year. The results show deviations in simulated AOD compared to static dust-source approach and increase in dustloads. Due to incoherent methodologies, estimates of tropical width variations differ significantly across studies. Here, methods for eight commonly-used metrics of the tropical width are implemented in the Tropical-width Diagnostics (TropD) code package. The method compilation and analysis provide tools and information which help reduce the methodological component of the uncertainty associated with calculations of the tropical width. The break-up of ice crystals in clouds is a possible secondary ice multiplication process to explain observations of very high concentrations of small ice crystals at cold temperature. Here, the process is modeled by considering shocks between fragile aggregates (assemblage of pristine crystals) and large densely rimed crystals of selected sizes. The simulations of two storms illustrate the perturbations caused by the break-up effect (precipitation, ice concentration enhancement). We conduct three simulations of atmospheric chemistry using chemical mechanisms of different levels of complexity and compare their results to observations. We explore situations in which the simplified mechanisms match the output of the most complex mechanism, as well as when they diverge. 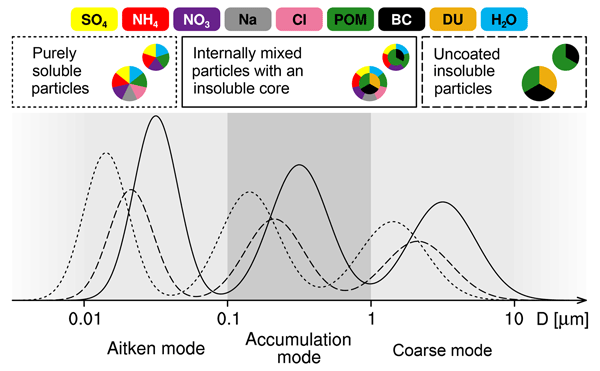 We investigate how concurrent utilization of chemical mechanisms of different complexities can further our atmospheric-chemistry understanding at various scales and give some strategies for future research. Weather and climate predictions of cloud, rain, and snow occurrence remain uncertain, in part because guidance from observation is incomplete. We present a tool that transforms predictions into observations from ground-based remote sensors. Liquid water and ice occurrence errors associated with the transformation are below 8 %, with ~ 3 % uncertainty. This (GO)2-SIM forward-simulator tool enables better evaluation of cloud, rain, and snow occurrence predictions using available observations. We describe a new version of the aerosol-climate model ECHAM-HAM and show tests of the performance of model by comparing different aspects of the aerosol distribution with different datasets. The updated version of the HAM aerosol model contains improved descriptions of aerosol processes including updated emission fields and cloud processes. While there are regional deviations between model and observations, the model performs well overall. In this project, we compare three different approaches to integrate the fluid-motion equations when applied to solve atmospheric flow dynamics. Differences between the three methods reside in accuracy as well as computational cost. The results illustrate that there is an intermediate solution that performs well in terms of computational cost while at the same time producing good enough results, as long one is not interested in the smallest turbulent scales. In this paper, we introduce the most up-to-date version of the flexible tracer framework for the ICOsahedral Nonhydrostatic model with Aerosols and Reactive Trace gases (ICON-ART). We performed multiple simulations using different ICON physics configurations for weather and climate with ART. The flexible tracer framework within ICON-ART 2.1 suits the demands of a large variety of different applications ranging from numerical weather prediction to climate integrations. The complexity of ice nucleation mechanisms and aerosol--ice interactions makes their representation still challenging in atmospheric models. 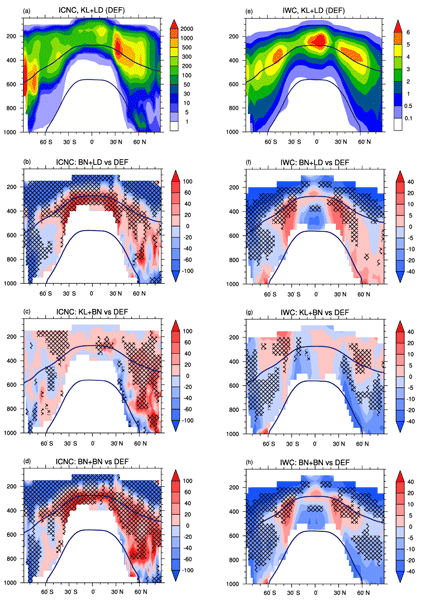 We have implemented a comprehensive ice crystal formation parameterization in the global chemistry-climate model EMAC to improve the representation of ice crystal number concentrations. The newly implemented parameterization takes into account processes which were previously neglected by the standard version of the model. 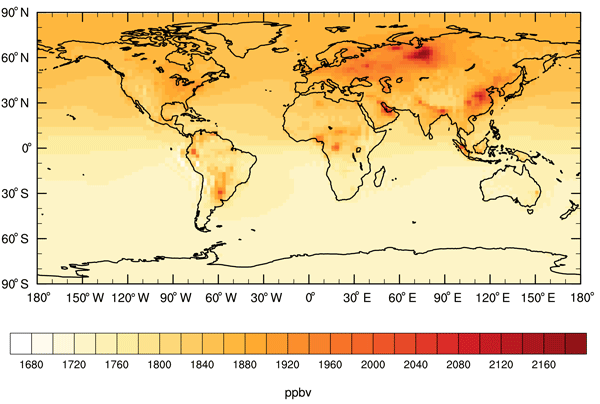 Atmospheric chemistry models are used to study the impact of air pollutants on the environment. These models are highly complex and require a lot of computing resources. 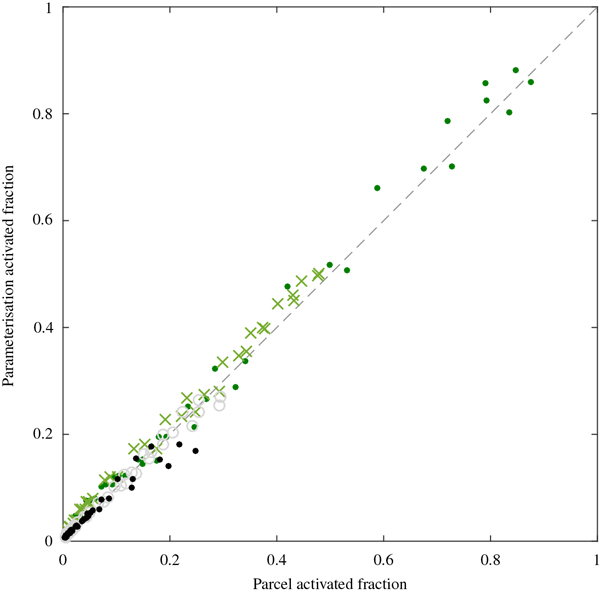 In this study we show that machine learning can be used to simulate atmospheric chemistry with an accuracy that is comparable to the traditional, computationally expensive method. The machine learning model has the potential to be much faster and to provide more detailed air quality forecasts. Lagrangian cloud models are a powerful tool to understand cloud microphysics and are increasingly used in the cloud physics community. 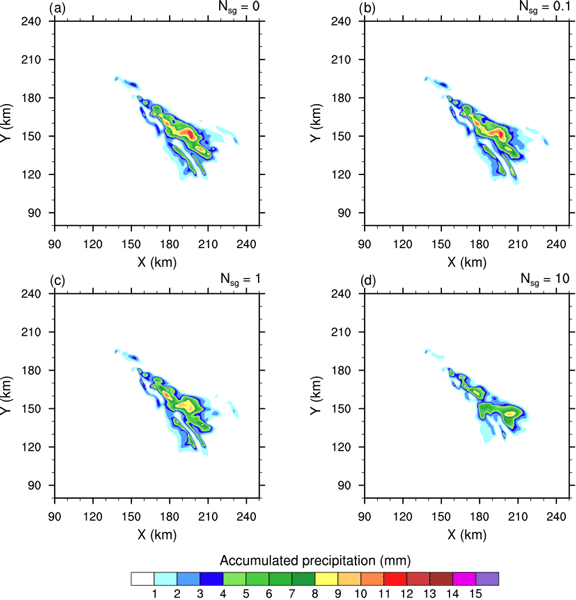 In this study we present a method designed to improve the warm cloud precipitation process in such models. Our results indicate that using this method is essential for a proper representation of the collisional process of warm clouds, while maintaining an appropriate computational demand. Accurate air quality forecasts are critical to protecting human health and the environment. 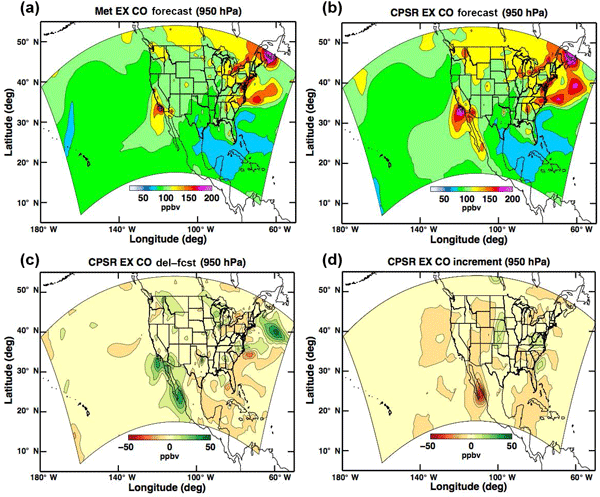 This paper shows how ensemble assimilation of MOPITT CO compact phase space retrieval (CPSR) profiles in WRF-Chem/DART provides significant improvements in the air quality forecasts over the CONUS when compared to independent remote (IASI CO retrieval profiles) and in situ (IAGOS/MOZAIC) observations. It also extends the CPSR algorithm to assimilation of truncated retrieval profiles. libcloudph++ is a free and open-source library of schemes representing cloud microphysics (e.g. condensation of water vapour into cloud droplets, collisions between water drops, precipitation) in numerical models. This work adds new schemes that represent aqueous chemical reactions in water drops. The schemes focus on the oxidation of SO2 by O3 and H2O2. The libcloudph++ is now capable of resolving the changes in aerosol sizes caused by both collisions between water drops and aqueous oxidation. We have implemented a regional, high-resolution, and computationally attractive carbon dioxide data assimilation system. This system, named CTDAS-Lagrange, is capable of simultaneously optimizing terrestrial biosphere fluxes and the lateral boundary conditions. The CTDAS-Lagrange system can be easily extended to assimilate an additional tracer, e.g., carbonyl sulfide (COS or OCS), for regional estimates of both net and gross carbon fluxes. 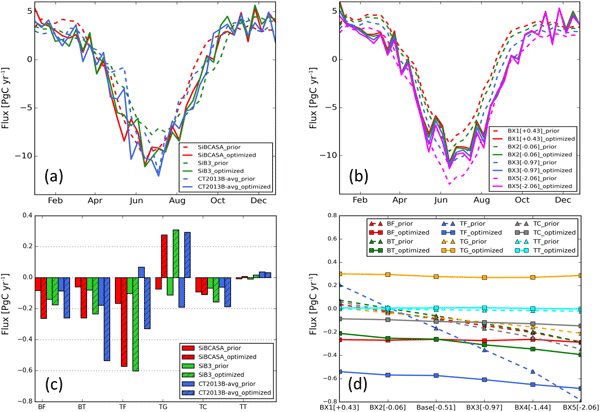 The authors discuss the implementation and performance of a simple one-dimensional sea ice scheme within the ALADIN–HIRLAM numerical weather prediction system. 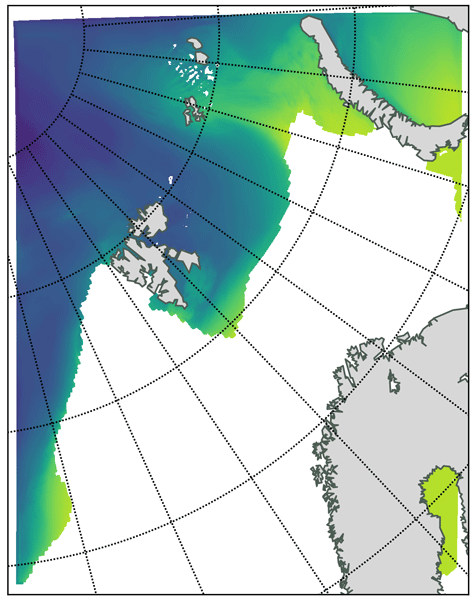 This scheme is developed to replace the prescribed sea ice surface temperature that was used before. Numerical experiments over the large ice-covered areas of the European Arctic show that new scheme helps to improve the modelled 2 m temperature in regions that are influenced by sea ice, especially when the forecast is longer than 12 h.
A new module, ORACLE 2-D, that calculates the concentrations of surrogate organic species in two-dimensional space defined by volatility and oxygen-to-carbon ratio has been developed and evaluated. ORACLE 2-D uses a simple photochemical aging scheme that efficiently simulates the net effects of fragmentation and functionalization. 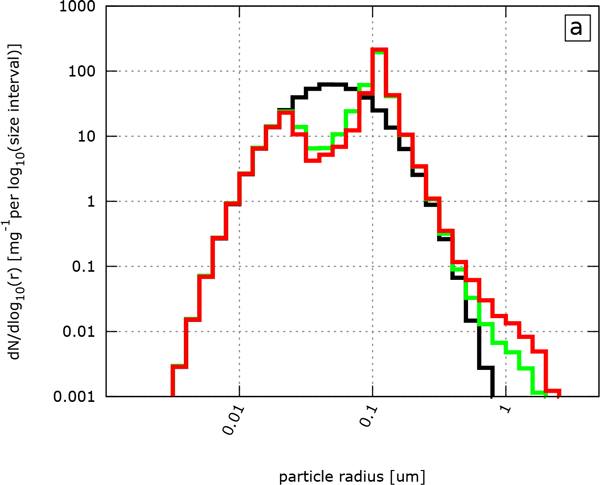 ORACLE 2-D can be used to compute the ability of organic particles to act as cloud condensation nuclei and serves as a tool to quantify their climatic impact. Chemistry is an important component of the atmosphere that describes many important physical processes. However, atmospheric chemical mechanisms include hundreds of species and reactions, posing a significant computational load. In this work, we use a powerful reduction method in order to develop a computationally faster chemical mechanism from a detailed mechanism. This enables accelerated simulations, which can be used to examine a wider range of processes in increased detail. Clouds form when water condenses onto particles in the atmosphere and the size and chemical composition of these particles can have a large influence over how much water condenses and the subsequent formation of cloud. Additional gases exist in the atmosphere that can condense onto the aerosol particles and change their composition. We present a fast and efficient method of calculating the effect of atmospheric gases on the formation of cloud that can be used in climate and weather models. Summer precipitation over China in the MetUM reaches twice its observed values. Increasing the horizontal resolution of the model and adding air–sea coupling have little effect on these biases. Nevertheless, MetUM correctly simulates spatial patterns of temporally coherent precipitation and the associated large-scale processes. 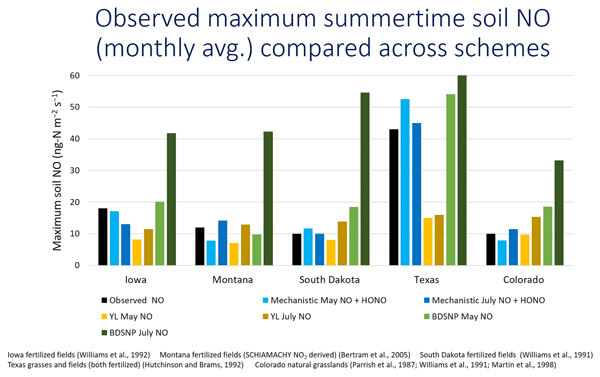 This suggests that the model may provide useful predictions of summer intraseasonal variability despite the substantial biases in overall intraseasonal variance. The TransCom inter-comparison project regularly carries out studies to quantify errors in simulated atmospheric transport. This paper presents the first results of an age of air (AoA) inter-comparison of six global transport models. Following a protocol, six models simulated five tracers from which atmospheric transport times can easily be deduced. 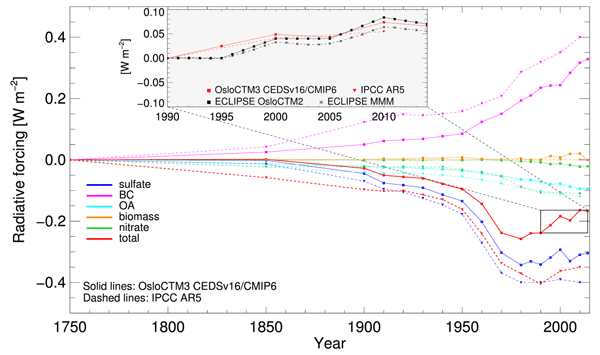 Results highlight that inter-model differences associated with atmospheric transport are still large and require further analysis. 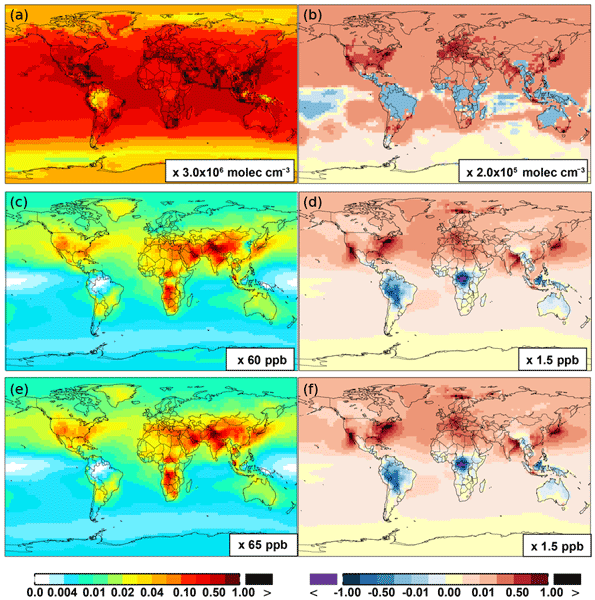 Global atmospheric chemical transport models are crucial tools in atmospheric science, used to address problems ranging from climate change to acid rain. GEOS-Chem High Performance (GCHP) is a new implementation of the widely used GEOS-Chem model, designed for massively parallel architectures. 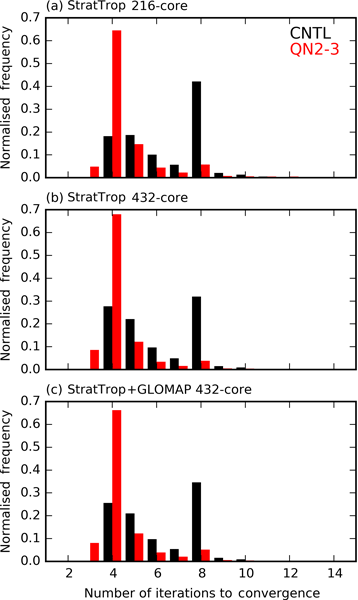 GCHP v11-02c is shown to be highly scalable from 6 to over 500 cores, enabling the routine simulation of global atmospheric chemistry from the surface to the stratopause at resolutions of ~50 km or finer. The U.S. Environmental Protection Agency is developing a new modeling system to investigate air pollution pathways on a global scale. We plan to use the Model for Prediction Across Scales – Atmosphere (MPAS-A) to define the meteorology that affects air pollution transport and fate. In order to do so, MPAS-A must accurately reproduce historical weather conditions. 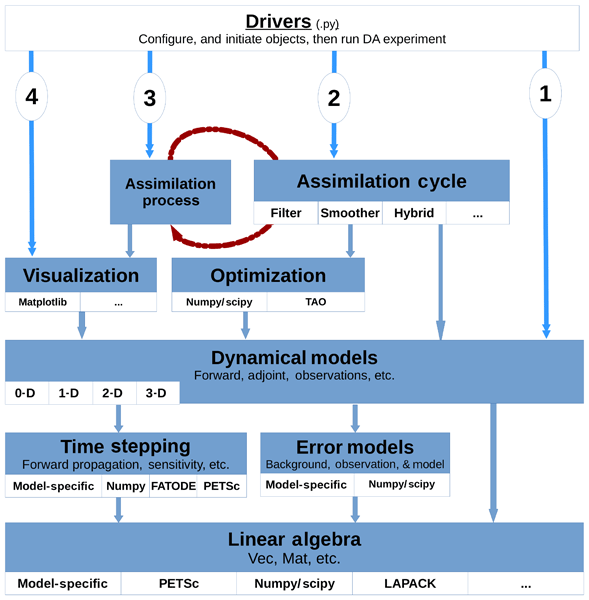 This work demonstrates that our implementation of four-dimensional data assimilation by analysis nudging provides that capability.